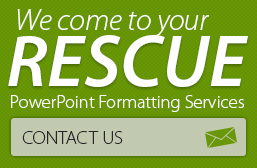 For the busy business consultant, we offer 24 hour turnaround PPT services. Think presentations, and you are thinking PowerPoint. Be it pitching an idea, selling a product, initiating a discussion – the software offers a host of features that helps you make an impressive opening with your audience. While optimizing the key features offered by the software, many users also stumble into a range of formatting issues and errors. As any presenter, who has discovered a formatting error just 30 minutes ahead of an important meeting, would know, these issues can be pesky, stubborn and inconvenient, and ruin an otherwise well drafted presentation. Here, we look at some of the most common formatting issues, organizing across the most complex to the simpler, basic ones that can be easily fixed. Read why these happen and get tips for formatting PowerPoint presentations and handling common issues or errors that may come up. Usage of fonts – Very often, a font style that you may have used while creating your PowerPoint presentation, might not get displayed while you open the presentation file on someone else’s computer. This is because Microsoft PowerPoint is not embedded with fonts by default, and the fonts available on your computer might not be available on others’. In such situations Windows would typically substitute with another font, resulting in text that might not look as impressive as you planned. Remember that on an average most computers have over 300 types of font loaded, so to avoid such situations from occurring, it would be best to use some of the most commonly used fonts such as Arial, Times New Roman, Tahoma, and Verdana. Another approach would be instruct PowerPoint to embed the font, which will ensure that the text on your presentation file will be displayed with your chosen font type on any computer (on PowerPoint 2003 – go to the Main Menu, select Tools -> Options and then select Save tab on the form that pops up). Note that embedding fonts can however make your presentation file bulky, so do weigh the benefits before you proceed, else, stick to the most commonly used fonts. Embedding objects – Many of us use sounds and movies to jazz up our presentations, but these can be quite problematic when they don’t work. It is best to use such embedded objects only when you are showing the presentation file from the same computer on which you created it. If you are planning to share the presentation file with another computer, always make sure you share the sound/ movie file, so that you avoid last minute panic. Bullets!! – All too often, zealous presenters pack in way too much content into their presentations. And this can be remedied by using the simplest of PowerPoint features – bullets. Bullets help with making information look neat, concise and well drafted. Importantly, they highlight the essential points, and help drive better understanding to your audience. Slide masters are important – Besides helping you keep presentation slides consistent, slide masters help you save precious time, and avoid many potential formatting challenges. Diligent use of the slide master helps retain your corporate logo in the same position, ensures consistency in the style and size of bullets and fonts throughout the presentation, and avoid repetitive tasks such as reinserting logos, checking font styles etc. To view your slide master go to the Main Menu, select View -> Master -> Slide Master. The layout, text effects and positioning as seen on the slide master will be your default layout across all the slides in your presentation file. Use graphs judiciously – Using graphs and tables can greatly enhance the quality of your presentation, but don’t go overboard. Pick the graphs that are most meaningful, and help drive the key points to your audience. If you must use text on the slide as you have positioned your graphs, ensure you have adequate ‘white space’ to avoid a cluttered look. It is also a good idea bullet your points, so that your audience can focus on the key takeaways as they scan your graphs. Check spellings always – Presentations are about impressing, and why ruin a week’s worth of work because of poor spellings. Run a spell check always. Its easy – simply select Tools -> Spell check, and any spelling issues would be instantly highlighted. Copied images spell trouble – Using images in presentations help break the monotony of text and data, but copying images from external sources may not be a great idea. As images are typically designed to be light and small, they look ugly and pixelated when stretched (most presenters want them to look bigger for better visibility). If you must use images, scan through Clip Art to check the free images made available by Microsoft. They are designed for use in PowerPoint presentations, and help can be inserted without any trouble. To use Clip Art go to the Main Menu, select ‘Insert -> Clip art’, and you can instantly download a stunning collection of images. 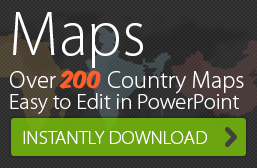 You could also purchase high-resolution images and use them in your PPTs. Alignment is everything – Proper alignment can take your presentation from boring to brilliant. To ensure correct alignment of all objects and text, make sure you activate guidelines, create a basic grid to organize content, and include alignment features on to your Toolbar. A well-aligned presentation file looks effortlessly slick and professional. Go easy with color – This might be obvious, but use too many colors and you risk ruining your presentation. Choose color combinations that work well – for instance, complementary colors / colors within a shade palette are always pleasing to the eye. Ensure you stick to a neat and consistent color scheme, for a professional look. Know where you are presenting – An oft ignored point, it pays to be aware of your presentation venue, its layout, and the external lighting to improvise on the formatting of your presentation. Being aware of these aspects will help you choose the right font sizes, appropriate color palette, text effects etc., and greatly improve the audience experience.